20 tips for healthy eating on a budget from a dietitian nutritionist. Purchasing unique foods, superfoods, plant-based foods, and whole foods, in general, can be quite expensive — but it doesn’t have to be! You can navigate your own kitchen, markets, and bulk bins to continue living a healthy lifestyle eating whole foods while staying on budget. Learn how to eat healthy on a budget. All of us want to be able to eat healthy whole foods as much as possible without spending our savings. Healthy eating can be an investment, but it’s an investment in your health which is the most important investment of all. Regardless of if you’re on a budget or not, these are amazing ways to eat healthy, plant-based, and whole foods and tips that you can live by each week. Here’s what has helped me shop smart and still eat healthy foods while staying on budget. Beans, lentils, legumes, pulses – whatever you may call them, all are fantastic ways to bulk up any meal in terms of volume and also in calories and nutrition without costing you much. Dry pulses such as beans, peas, chickpeas, etc. are great to purchase in bulk and store well in airtight containers or mason jars. Opt for getting organic fruits and vegetables that you eat the skin of — strawberries, spinach, nectarines, apples, grapes, peaches, cherries, pears, tomatoes, celery, potatoes, and sweet bell peppers. Prioritizing the organic options will help decrease the overall amount of needing to purchase all organic produce. Buy in bulk as often as possible. At first, you may think you’re spending a lot of money on bulk specialty items, but when you break down the costs per serving, you’re actually saving money in the long term. For example, I always buy spirulina, chia seeds, hemp seeds, and other “superfoods” in bulk. This principle can also be applied to your beans, grains, and other produce items as well. Frequent wholesale stores and your local farmer’s markets. If offered in your area, get involved in CSA’s (community supported agriculture) or a community garden. Wholesale stores are stepping up their game when it comes to offering high-quality foods in bulk, organic produce, and even organic animal proteins if you incorporate those. If you can’t buy it, try to grow it! Growing gardens, whether personal gardens or communal gardens, is a great way to have local, seasonal, and healthy food right at your fingertips. It also is a great teaching/learning experience for everyone in the family. Remember the season! Trying to get strawberries in the dead of winter is quite expensive in comparison to purchasing them when they’re perfectly ripe and local to your region in the summer (Nashville for example). Buy produce when it is in season to get the best price. Don’t neglect the frozen aisle of your grocery stores. To clarify, I’m not a fan of highly processed frozen entrees and meals. What I’m referring to is strictly the frozen veggies and fruits with nothing added to them. For example, if you’re shopping for frozen raspberries, then the only ingredient should be “frozen raspberries”. Most grocery stores also have organic frozen fruits and vegetables so you can stick to buying organic easily if it’s frozen. I’ve said it a million times, and I’ll say it forever. Cooking in bulk or large batches will not only save you a tremendous amount of time for the week ahead, but it can also help you prepare meals using all your bulk purchased items for later by simply freezing. I know superfoods are all the rage now and I use them very often, but there’s no need for expensive superfood powders to get the nutrients your body needs. Don’t forget the not so glamorous and highly publicized superfoods like broccoli, red bell peppers, kale, romaine lettuce, sweet potatoes, etc. All whole foods are “super” foods in my book! The darker and more vibrant a colored fruit or vegetable, the better. Start cooking with nuts and seeds. Not only are they calorically dense, but they’re also nutrient dense for a very small amount. I often buy nuts/seeds in bulk because I’m constantly using them in recipes and they’re so easy to top onto salads, make your own nut milk with, add to desserts, etc. Check out the Food Index for the nutrition and health benefits of common nuts and seeds. Whenever possible, make your own version of the store bought. Ideas include hummus, baba ghanoush, soups, nut milk, ice creams, smoothies, juices, etc. You’re often paying for the convenience and brand rather than the actual ingredients, plus did I mention it’ll be much healthier? Well, it will be! Cooking large batches of beans and lentils then freezing them in mason jars is a great way to save yourself time and cook on a budget. Other ideas for frozen foods include cooked rice, roasted vegetables, and proteins of your choice. Just freeze them in an airtight glass container until they’re ready to be reheated. Buying in bulk? College student rooming with someone? Share the costs of healthy eating by buying in bulk or purchasing a CSA membership together. Purposefully try to catch the tail end of farmers markets. Most often, farmers are willing to negotiate a bit more because they’d ideally like to share their produce with someone rather than bring it back home! Preparing meal ideas for the week ahead not only saves you time but can help save you money by purchasing only the necessary ingredients you need. Check out my Batch Cooking 101 post on more tips and how-tos to help your family prepare meals ahead of time. Prioritize the foods and items you need by making a list before you leave the house. This helps cut down on impulse buys and keeps you on track with the meals you’ve planned! It’s smart to clear the house with foods and goods that can easily be donated that don’t necessarily mesh with your goals and lifestyle. It’s also a great way to take inventory of what you do have to prioritize your next grocery trip. Also, check out my post on Pantry Organization like a Pro to make sure you’re keeping the ingredients fresh! Using frozen or leftover fresh fruit is a great way to make your own canned jams for several months ahead. 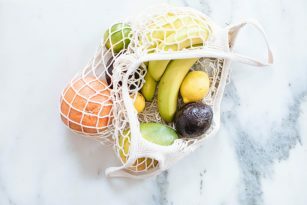 You’re not wasting any fruit by discarding, but reusing instead! Check out my recipe for Raspberry Orange Chia Jam to get you started. Storing your bulk items in airtight containers is a great way to keep your grains, nuts, seeds, and beans optimally fresh. Arrange your refrigerator in a way that air is well circulated and keeps everything nice and fresh. I find it useful to store all my greens in large bags or bins to keep them fresh versus keeping them in store-bought packages or wrappers. Make your own flours! By purchasing grains, nuts, and seeds in bulk you can easily use a blender or grinder to make your own flour. Store in a mason jar in the fridge to keep it optimally fresh. What was your favorite tip today? Share and comment below, I’d love to hear what you all think of these tips and more “how to” blog posts you’d like me to cover. I hope these tips help you on your next trip to the store!